1. Change your habit: The most common problem I encounter with this type of issue is routine. There’s no better way to stop progress than to actually stop progressing (think about it). Results tend to fly out the window as soon as habit forms. For example – running 3 days a week for 30 minutes is a great way to get in shape; however if that’s all you ever do your body will actually get used to running the same route at the same speed day in and day out. The workout becomes predictable and your body starts to expend the exact amount of energy needed to sustain that activity (nothing more). The best way to start seeing results again is to shock your body out of the “norm” and into a zone where it starts to burn fat again. 2. Try something new: One of the best ways to shock your body out of the “norm” is to try something new. Try jumping off the treadmill and get on a row machine instead. Get off the jog trail and find a jumprope. Don’t go straight for your nice flat walking trail – head up to a trail for a hike or find a section of road with some hills! If you’ve never tried cross-country skiing before this winter is the time to rent some equipment! Incorporating these different forms of cardio can help get you back on the fat-burn track. 4. 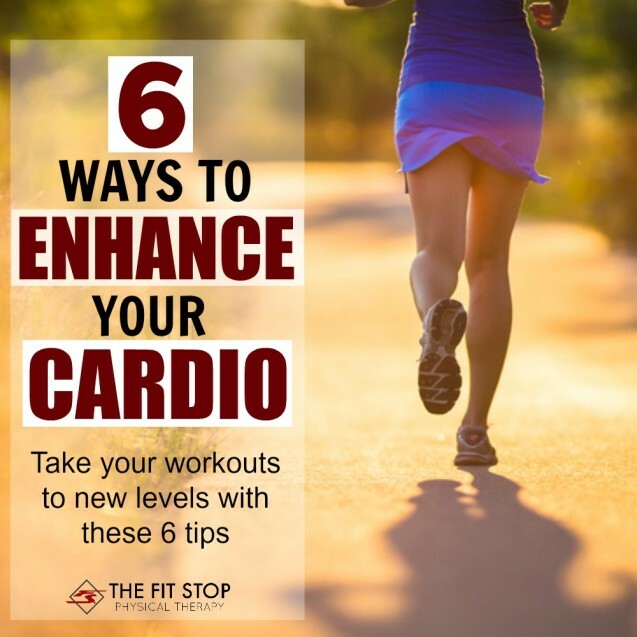 At-home cardio can be just as good (if not even a lot better) than gym or outdoor cardio: Oftentimes people are under the misconception that unless they can get to the gym or go outside there’s just no way for them to get in a good cardio workout. Totally not true! There are plenty of great at-home exercises you can string together into a killer cardio session! Check out this link for a few of my favorite at-home cardio workouts. 5. Drop a beat: Ever noticed how when “your song” comes on during your workout things get a little easier? Your pace gets a little quicker, the weights don’t seem as heavy, and you seem to move a little swifter? Music has actually been proven to be a powerful way that you can take your workout to the next level. Try to find a playlist that is upbeat with a fast tempo and then try to match that tempo while you’re running. Here are 50 of my favorite running songs to help get you going. 6. There’s always strength training: Alright, alright… I know this isn’t exactly a way to “enhance your cardio”… but if you’re stuck on the dreaded weight loss plateau and are interested in seeing progress again, I highly recommend doing some resistance training to get you there! Resistance training is a great way to increase lean muscle mass. The more lean muscle you have, the more energy it needs to stay alive. The more energy it needs the more it consumes in the form of calories and, upon depletion of available calories, our bodies start to metabolize fat! If you’re looking to start seeing results again, strength training is an excellent way to do so! If you’re hoping to start seeing amazing results from your cardio again I highly recommend incorporating some of these easy changes. Pick one or two that sounds the most interesting to you and try them out this week! It might be difficult at first, but I promise you will start to see amazing results again faster than you think!